THe bag is such a beautiful addition to the overall look! it's definitely a good formula to follow! 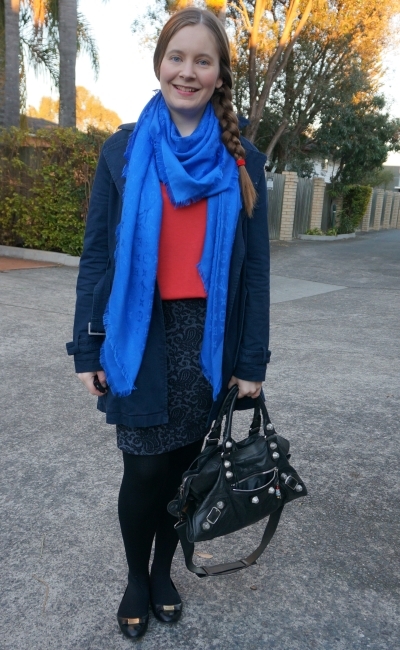 I especially love red and blue together for a nice bright combination! This is a great outfit formula, Mica!! I see what you mean about the second tee and it's color---it's one of those that changes with the light probably!! But I think because it's not the focal point it doesn't really matter. It still looks nice! Cute outfits and love the bags. I think these pencil skirts are my favorites in your collection! And isn't it funny how things can look different on the computer screen vs real life? This happens to me especially with lip colors, but it's probably my photography skills or lack thereof. :) Hope your week is off to a good start! Haha yes I'm sure the skill of the photographer (or lack in my case!) comes into it! I have always loved a t-shirt with a pencil skirt. There is something about the casual top with a more structured and fitted bottom that makes for a great pairing! Hope you get some sunshine soon! I'm enjoying that it's getting lighter each morning! Such lovely looks! I hope you're having a great Monday!! The bright scarves add a fun pop! Yes, it holds a lot, it is perfect for work! Thank you! I've been wearing this hairstyle often! Love the olive green with that skirt. I watched you august buy video and you got a lot of nice things for a great price. Thanks! This tee is one of those great bargains! I like both outfits, Mica - that second tee definitely reads as grey to me. Have a good week! Both outfits are perfect. I love how you paired your tees with printed pencil skirts. I do love a nice pencil skirt. The bag is very pretty too. You look lovely. these outfits make me so excited for fall time! hehe thanks! I'm excited for it to warm up as spring arrives! I love how you are pairing the scarfs with the tees! I also saw that on your vlog. It looks very current! It will be time to pull out my scarves soon! Hope you have a great week! Hope you're having a lovely Tuesday morning! You really have formulas for everything. And you can with that same formula give two examples of looks and I admire this in you, because people can be inspired by you, not copying. 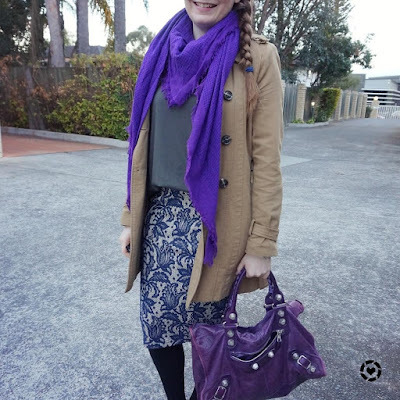 The basis of the look is there - the formula- sweater + skirt + scarf+bag, and so with the clothes that people have at home they don't need to be exactly the same as yours they can use this formula and create his own looks. Thanks Marisa! It's nice to show that a similar formula can create such different looks! I agree, it looks pretty grey in the pictures, but that can change with the lighting. I have one similar top that seems to change color with the weather and I love how versatile it is. Thanks Anne! I'm looking forward to wearing this more and enjoying that it's not really just one colour! Tees look great and I love your Balenciaga collection! Have a great week. Ooh I love the greenish gray shade of that second tee, and I actually love it with the purple! I think I'm going to keep my eye out for something similar in color--I really like how versatile it is. Have a great week Mica! I love pairing basic tees with skirts too. It has a casual chic vibe to it. Such great colour combinations. Bold and beautiful! Both outfit are so lovely! I do love pairing red and blue together as well. I really want a blue scarf like yours! That is so fabulous. I love both color combos! So fun and bright! I'm especially loving all the purple hues in the second outfit! Gorgeous scarves!! Blue will always suit you so beautifully. 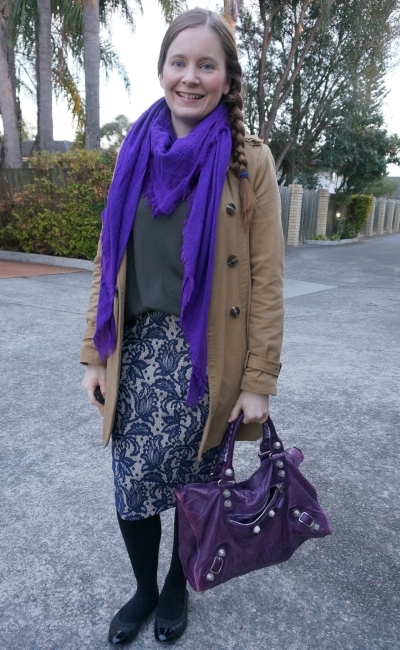 I also love how you paired the purple scarf with your Balenciaga bag and neutral outfit. Hope you and your family feel much better now, by the way! Thank you Deb :) We are all feeling much better! Love a pencil skirt with an interesting print like these! The texture is really cool! That just happened to me - I though a tank a purchased was a little more burgundy colored when in reality, I think it's a brown/tan. I do like how both outfits turned out though - it's amazing how we can pair tees with just about anything and make them work! It's funny how things can change like that - will be a really versatile top though I think! Thanks Gabrielle :) It's a beautiful shade of blue! You put outfits together perfectly! 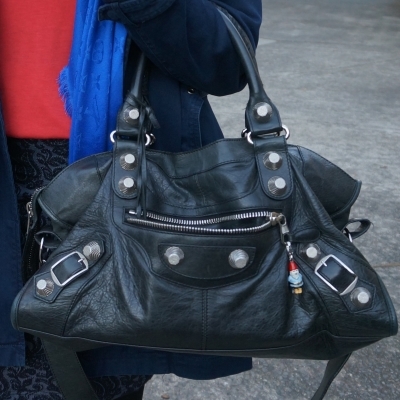 I just love that balenciaga bag!! I definitely couldn't tell if it was grey or olive green until you said so either! I love the red tee on you! When you find a good tee, you always need to get multiples! I wear plain colored tees on a daily basis! It is really one of those in-between colours! :) I'm looking forward to getting more wear from these tees, I agree they are a great basic to have! I agree about a plain tee/top being a good choice for a textured skirt. It makes putting the look together so easy. Out of the two looks, the first is my favorite. I love the combination of bright colors. I love both! You have an amazing collection of handbags and scarves! They come really handy for switching up looks! You look great! Thank you! I do love my accessories :) I don't do follow for follow though. 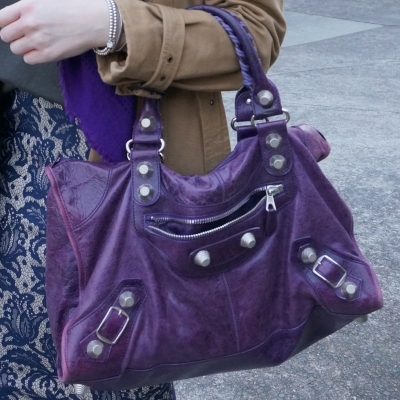 That's such a chic bag. So versatile and classic style. I am loving the scarves and your Balenciaga, Mica! Always love that bag! Hope you're well! I have one Bbag and love it! It is a light pink and so light to carry! I love your black one and purple. i could see carrying the black often. 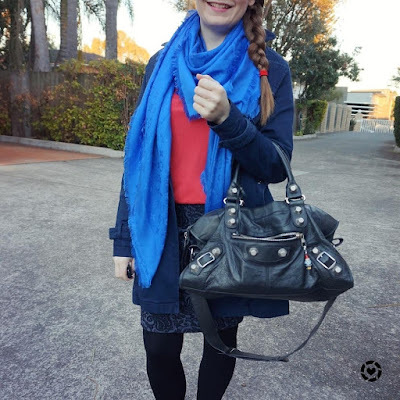 I love the colors you chose from your outfit especially the red and blue together and the print of your pencil skirt. Pretty! !